I enjoyed this book because there were a lot of mysterious things happening and at some points I didn't want to put the book down. I really enjoyed the character Olive because the liked trying to solve her sisters code whom went missing (the sister is called Sukie). This book has made me want to find out more about history because it is set in the 2nd World War and was very interesting so I would love to find out more. I want to read more books by Emma Carroll because they are very interesting and mysterious. I have read Letters from the lighthouse - by Emma Carroll which I have thoroughly enjoyed. The book is packed with mystery and suspense which made me want to read it as I love mystery and history books. The story was amazing with a happy ending and it hooked me in very well, I kept reading the WHOLE day on Sunday because it was sooooo good. This is the first book of Emma's I have read which gives me a quite rough idea of what other adventures she has written and I now look forward to reading another book of hers. 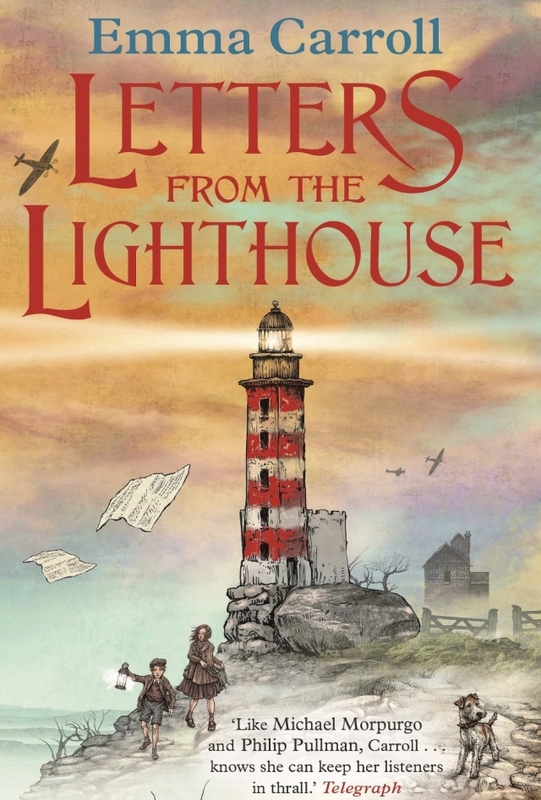 The story is set in WW2, February 1941, about a young girl named Olive and her brother(Cliff) whose big sister gets lost and are evacuated to Devonshire to live in a light house on Devon's edge with a mysterious lighthouse keeper. There, Olive has to solve a mystery of her own: a strange coded letter holding very important information which seems to link her sister (Sukie) with Devon and to something important and impossibly dangerous. I have read Letters from the Lighthouse by Emma Carroll which I have thoroughly enjoyed. The characters and the setting was descriptive with selective vocabulary suitable for the themes. The story was set in February 1941 at the beginning of the second World War in London and Devon, two very different cities. The characters include a mature girl named Olive, her older sister Sukie who has a strange pen pal, her younger brother Cliff and her widowed mother. There is a good variety of characters in the story as their culture, personality and behaviour. Letters from the Lighthouse has a unique plot which I personally think Emma Carroll has succeeded in to make it a bestseller. Olive, Sukie and Cliff go to the cinema to brighten up their mood as a few weeks ago they found out that their father had died as a soldier but was very proud to be dying for his country. At the cinema, Sukie needs to go to the bathroom and leaves them watching the film. After a few minutes, the air-raid goes off. In panic, Olive leaves Cliff to go and find Sukie. She notices her well-dressed sister talking to a man dressed in black. Just then, everything goes black. Sukie disappears and Olive faints. With London unsafe, Olive and Cliff are evacuated to the Devonshire coast to stay. Over there they need to solve many mysteries. They find a code in Sukie's coat pocket and then who was the man she was talking to was another question they had to find the answer to. The historical information I have learnt from this book is that Jews were not given permission to evacuate to any country. Only some countries gave permission. In this book, there were not a lot of illustrations but the ones there were, were thorough and detailed to help visualise the story. I would personally recommend this story a 4 out of 5. The illustrations just let me feel a bit disappointed but overall the plot was enthralling with an original storyline. This book is about a brother and sister, Cliff and Olive, who are evacuated from London to Budmouth Point during the Second World War. Their older sister Sukie is missing and no one knows if she's still alive. Why was Sukie dressed up like her mother when she disappeared? Queenie, who runs the post office in Budmouth Point, and Ephraim, the lighthouse keeper are hiding a secret. Are more people in on the secret, or not? Olive is trying to unravel the mystery, is she too late or not? It is a thrilling and exciting book to read. It is a fictional book about what happened to the children who were evacuated. ˜Letters from the Lighthouse' is a page turner.Â I could not put the book down. I enjoyed ˜Letters From the Lighthouse' because it was exciting and had a great plot. I loved all the adventure and action. The book was such a page turner that I read it in a da. It shows that World War II was a hard time for people, especially for Jewish people. It tells the reader about all the difficult times that people faced during the war, such as Kindertransport, Hitler and deciding whether to evacuate your children. It must have been really hard to leave your family, go to a different country and try to speak a new language. I felt transported into World War II: the rushing when there was an air-raid siren, why some children wanted to be evacuated and why some children did not, living with rationing and experiencing different lifestyles once evacuated. My favourite character was Queenie because she was kind. She was also quite strange. It is funny how her clocks do not work and she is always late. She was fair-minded and was not prejudiced towards the Jews. Queenie was not very bothered about her appearance. She let Esther stay at her house because she was sympathetic towards this child who had been through some very difficult experiences. My favourite part was when Sukie came back. She explained that she had been in France, trying to support the Jewish refugees. The book had a happy ending, despite the difficult experiences the characters had endured and if I could, I would give this book a five star review. It is really well written. I loved how Emma Carroll told true events in history but made them fictional. This book is absolutely fascinating. It is set in World War II and is based around a family living at that time. The story begins when Olive, her older sister Suki and her younger brother Cliff go to the cinema and get caught in an air raid attack. Before the air strike , Olive sees Suki talking with a man. When the bomb hits, the children get separated and Suki is nowhere to be seen. All that was left of her was her mother's coat and a coded note in the pocket. After Suki's disappearance, Olive's mother fears for her children's safety and evacuates them to Devon where they stay in a lighthouse. Even though Olive is in Devon, she is determined to find out what really happened to her sister. Olive is still convinced that she is still alive somewhere. I found this book full of emotions. I laughed, cried and felt anxious much of the time. My favourite character is Olive because she is adventurous and good at breaking codes. I also found the book very realistic because it is set in World War II and this book has made me hungry for more information. It's really good and definitely should be recommended for school book corners. Really interesting for people who like history and mystery. Once you get into it you can't stop reading. My favourite part was when she helped the boat in from France. And finding out more about how Cliff and Olive's father had died peacefully in the chair it was very interesting to know what had led up to thatâ€¦ he'd had a headache and then he'd died. I already know a lot about World War 2 but it made me want to learn more about the people in the boats. I enjoyed this book very much. I particularly liked the character Sukie and I like the part where the bomb goes off while they are at the cinema. I thoughtÂ the history was so realistic and it's made me want to find out more about the history and that time period in particular. It seemed extremely realistic, so realistic I thought I was the character Olive and I would recommend it to someone who gets bored quickly because it has a lot of drama in it from the first few pages. Emma Carroll is now one of my favourite authors and am interested in looking into more of her books. I really understand Olive's feelings when she's on the train and Esther takes Cliff's BEANO. I think she is a kind, considerate person who adores her brother Cliff. My favourite character is Esther because she stands up to the most fierce, and even if she was a bully, that's changed now! I think she is now Olive's best friend and is willing to fight for those who can't. She has made a huge difference to herself since the beginning of the story. She shows why people bully and why they stop, my answer is, they need love and for them to be kind. Esther's story shows no matter what you look like, it's what's on the inside that counts. My favourite scene is when Esther and Olive go into the school and everyone unpicked the stars that had Jew in German on them. I especially enjoyed this book because I have such an interest for World War II. I would recommend this book to history lovers and gutsy people. I did enjoy this book because I like the characters in the story. I thought that the story was interesting and that the history in the book was believable. I found the history about World War II interesting and it encouraged me to try to find out more. LFTL is a fast-paced action-packed mystery, which is very intriguing. It is a definite page-turner and it is really exciting. You never know what is going to happen next. The story is set in February 1941 in England. German bombs are falling like pennies from a bottle when Olive and her family are struck by a bomb blast. Olive thinks that her mother and sister Sukie are both dead but soon she finds out the truth - her sister is in grave danger. I would highly recommend this book to a person who likes adventures and mysteries, and unexpected endings. It's extremely fun and extraordinary. History-lovers would also love this book. The reader really gets a feel for the dangerous living conditions in London during World War II. Initially, I didn't want to read a WW2 book, but having read it, I'm really glad that I did and it has left me in the mood for more Emma Carroll books. It gave me a feel for WW2 and the contrast between countryside and city life. I think it should be for aged 9 and above as it would go over the heads of younger children. It was accurate, clever and intriguing, and it also was fun and had a satisfying ending. I highly recommend it. This book was very enjoyable to read. Emma Carroll explains all of the characters in great depth and each character is unique in some sort of way.Â The main theme of this book is how peopole have to leave home to fight for their country but Olive soon realises that her father isn't coming home. After being evacuated, Olive and her brother Cliff are evacuated to Devon and the only place available is a lighthouse. To try and be helpful she becomes a postman and starts sending secret messages to her sister Suki who was lost in an air raid, but she finds a code which she is convinced relates to her but how far will she go for her sister? I enjoyed this book because it is set in the war and it gives you the feel of what it was like to be in it. My favourite character was Olive because she had a lot of courage and she did things for other people that needed help. She was always looking after her little brother Cliff even though it was tough. When I had read this book, it made me want to read lots more like it because it made you feel as if you were one of the characters. This book made me feel like I wanted to research the war and find out the little things that I did not realise about it. I would recommend this book to anyone who likes lighthouses and coded messages. This story really reminded me of Michael Morpurgo's style of writing. The first page really grabbed my attention and pulled me into the story. Although I havenâ€™t quite finished this book, I didn't want it to end. Emma really described the characters, their personalities and brought them to life. I extremely liked Olive because she reminded me of a friend from Cornwall (caring). I can really imagine living in the war from reading this book as the description can draw a picture in my mind. I think this was a good book for me to write a review on as I really enjoy reading war books; I have about 10 of them. I will definitely be looking out for more of Emma Carroll's books. Letters from the Lighthouse is a book by Emma Carrol. The book is set in February 1941 in London and Devon during WW2. The main characters are: Olive, Sukie, Cliff and Ephriham. Olive is 10, and she is dertemend to find out what happend to her sister. Sukie is Olives sister, who goes missing one night during an air raid. Cliff, who is 7, is Olive's younger brother. Ephtaim is the mysterious lighthouse keeper. They are evacuated to Devon where they try to solve the mystery of their missing sister. I enjoyed reading this book. I found the characters really interesting and there were some really exciting twists and turns but at times I found the plot a little bit confusing! I'm not sure if the history in the book was realistic as I think that Britain did allow refugees to come into the country in the second world war. I am already very interested in WW2. I would like to read more books by Emma Carrol and I would definitely recommend this book to other readers. I really liked this book because it was full of mysteries. But the only thing I didn't like about it was that when all the exciting bits ended there wasn't much happening for 3 or 4 paragraphs. My favourite character was Sukie because she really wants to help with this plan to save people, who live in other countries where the war is really bad. The other characters who are in the book are: Olive, Cliff, Ephraim, Pixie (the dog),Mum and Gloria. I thought the book showed the history of the war very well but I think it is more suitable for older children because as we know the war was a difficult time and a lot of people died. This showed me what it was like in the war. My favourite part was when they found a suitcase from one of the people that her sister was trying to save. The book was quite grabbing for me and I would definitely recommend this book to other people who like history like me. I loved this book. I like history but it wasn't just that, the story had mysteries and really good characters too. We have been learning about the war at school so it made sense to me but it might have some things that are hard to follow for younger children.